Reproduction of original manual. Covers repair for ALL 2001 Arctic Cat Models with 120 cc, Twin F/C, 500 580 600 800 cc Twin, 550 cc and Triple engine Snowmobiles. 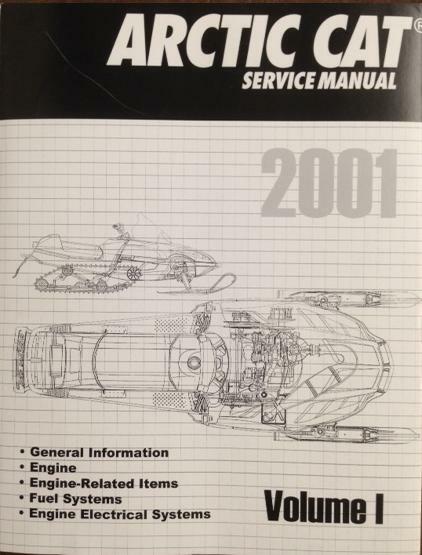 This repair manual is for the Arctic Cat snowmobile for 2001. This snowmobile repair manual are considered to be the only snowmobile repair manuals worth owning. It is used by some of the most prestigious professionals to your average everyday snowmobile owner. Along with clear pictures, special tools, detailed repair procedures, this snowmobile repair manuals always provides the most comprehensive information available for your snowmobile. The manual is 633 pages in length and the expert text gives you complete information regarding maintenance, tune-up, repair and overhaul. This manual provide step-by-step procedures based on the complete disassembly of the machine. Accurate, clear and concise text, combined with detailed illustrations and photography, make it possible for the novice snowmobile enthusiast to safely and enjoyably service their vehicle. At the same time, the in-depth coverage provides indispensable information for those tackling more complicated procedures.